Zaballa (Iruña de Oca) was a medieval settlement abandoned in the 15th century due to urban flight. Prior to that it had a manor monastery and later became something of a specialized factory location before its demise. Zaballa is one of the more than 300 deserted settlements known in Alava-Araba - rural spaces abandoned in historical times but now being studied by the UPV/EHU's Cultural Heritage and Landscapes Research Group. The most recent discoveries made there have been published in Quaternary International; most intriguing are terraced fields built in the 10th century — still visible in the landscape — that were devoted to the intensive cultivation of vines. "Archaeo-botanical studies of seed remains found in the excavations and pollen studies have provided material evidence of the existence of vine cultivation in a relatively early period like the 10th century," explained director Juan Antonio Quirós-Castillo. Metal tools discovered knowledge of the the agrarian spaces mean "owing to the nature of the crop spaces built and the agrarian practices developed, they are not compatible with cereal crops but they are with vines." he added. 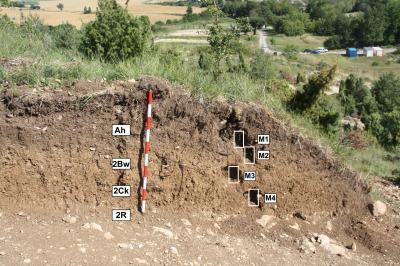 The recent analysis covers the geo-archaeological work conducted at Zaballa and Zornotegi (Salvatierra), another abandoned settlement in Alava, which became deserted in the 15th century and where the terraced fields were devoted to the cultivation of cereals. These discoveries have been made possible by the use of archaeological excavation protocols, and geo-archaeological sampling and analysis, which are new in Spain and which have allowed the cultivated fields to be dated and the agrarian cycle to be studied. "It is not so much about excavating a site, but about excavating landscapes," explained Quirós. "In other words, it is about abandoning the traditional concept of the site, understood as a monumental or monumentalized place, in order to get to know the context in which these places are located." In comparison with Zaballa, "Zornoztegi has a completely different history," he pointed out. "Even though it was founded at more or less the same time, it is a much more egalitarian social community in which such significant social differences are not observed, and nor is the action of manorial powers which, in some way, undermined the balance of the community." In Quirós' view, these microhistories constitute small windows into the past that allow one to analyse relatively complex historical processes directly, bottom upwards, "in other words, to see how the peasant community itself gradually adapts to the political and economic changes that take place in the medieval era and later." What is more, the analytical study of these places of production allows one to abandon those more traditional points of view of history which "conceptualize the high medieval periods as a time of technical simplification, as a meagre period in economic terms, since they point to considerable social and economic complexity. Specifically, it has been possible in these studies to see that there are various important moments in the Basque Country, 5th to 6th centuries and 10th to 11th centuries, which were decisive in the construction of our landscapes." The study of abandoned settlements allow one to understand not only the village forming phenomena and the reasons why they were later abandoned, but more than anything, the transformation and degradation processes of the abandoned villages. That is why Quirós is calling for these places to be regarded as part of archaeological heritage: "The space for traditional crops, still easily recognisable in the landscapes closest to us, are historical spaces brimming with explanatory significance to help us understand the societies of the past; indeed, they require attention which they have not had until now," he concluded. In fact, the farm land analysed is gradually being destroyed year after year as a result of recent mechanised agricultural practices which have had and continue to have a very considerable destructive effect on this "invisible" heritage.